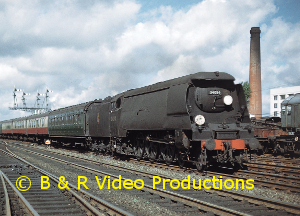 In this tribute to the Southern, we mostly feature footage taken at Waterloo and at a variety of different locations along the South Western main line to Southampton and beyond. There is even a brief glimpse of the Somerset & Dorset! 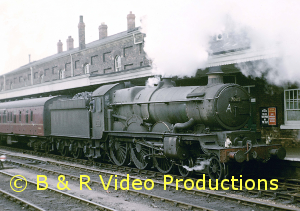 We start with a 1930s B & W clip of a King Arthur class 4-6-0 departing from Waterloo before moving on to the 1960s with views of passing trains, mostly Bulleid Pacific hauled, at Pirbright, Basingstoke and Battledown Flyover amongst others. In 1962, the preserved T9 passes through on a special! Back at Waterloo there is a hive of activity in and around the station throat, with Ivatt 2MTs (fussing about on pilot duty), arrivals, departures, light engine movements and green EMUs. We journey down the main line to Battersea, Clapham Junction, New Malden, Byfleet and Woking to see trains pass by hauled by Bulleid Pacifics and Standard classes. Even the “Bournemouth Belle” Pullman train passes by, both steam hauled and diesel hauled (by a green Class 47). Plus shunting in the carriage sidings with Standard Class 4 80089. A brief interlude, and at Southampton Docks we see 34032, light engine, and over on the S&DJR, Ivatt 4MTs near Combe Down Tunnel. More scenes follow at Clapham Junction and Farnborough before we head off to Brighton and Victoria to see apple green liveried LNER 3442 “The Great Marquess” and 4472 “Flying Scotsman” (twin-tendered) on rail tour duties as well as blue A4 “Sir Nigel Gresley” and Bulleid Pacific 34108 “Wincanton”. 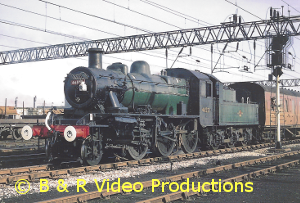 We return to Waterloo for more steam hauled comings and goings, glimpses of Warship, Class 47 and 33 diesels, steam hauled Cartic and breakdown trains plus a quick look inside the Power Signal Box. 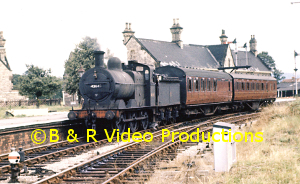 A few more clips feature steam action at Brighton and Andover. We conclude our tribute to the Southern with a cameo of Nine Elms Shed at the close of steam, followed by 35023 being coaled and watered before it heads off into oblivion. 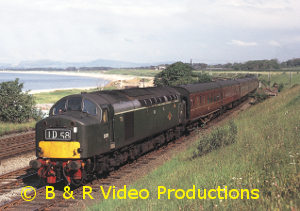 All the archive film used is mainly in colour and a commentary along with an authentic soundtrack has been added. 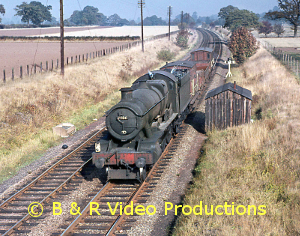 34094 “Mortehoe” approaches Basingstoke in 1960.